Some of My Combat "Secrets"
My favorite is what I call the 'roll turn'. This is where I line up in formation with the 'target', following just behind. As I reach the far left or right sides of the slope, the corners, and begin the turn back to the center, I bank sharply and complete the turn, rolling around over the top of the 'target'. Just as I finish the roll, I'm at an advantage and I dive down quickly, usually hitting the outside wing quickly causing a kill before the pilot realizes this. This is a cool way to fly, but usually won't fool the other pilots if you are already known for skill at slope combat. The basic idea here is to BE a target, fly slow, look crippled, be easy to hit. The deception is elegant, and takes advantage of that nasty "luck factor". 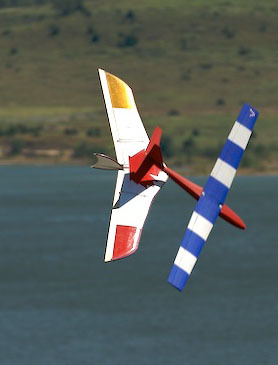 The best way to make "duck flying" work is to use a VERY LIGHT airplane so that you stand a far better chance at recovery than the poor lead-foamie sucker who fell for your ruse. I know this method works because of the many kills I have given away by being the fast heavy sucker who slams the ground just as hard as he slams the target, and too soon after! Duck flight works better with a flying wing than a conventional airframe, but even a warbird can make a strong duck if set up right. What we have here is an opportunistic strategy, wherein you fly a tight pattern within the gaggle of combatants, and using peripheral vision, constantly turn and burn at any available target that comes in front of your direction of travel. This will maximize shots at contact, both offensive and defensive, and may give high kill numbers if your recovery skill is up to snuff. Slash-n-trash, like duck style, works better with a light airplane, a fast heavy plane will not turn as quickly and will be harder to "save" from a difficult attitude. S-n-T works better in stronger lift conditions due to more energy being available. If flown on a weak day, S-n-T rapidly becomes Duck Flying! Finally we come to the Bad Boy of slope combat. Being good at SAM launching can make you really unpopular with your fellow fliers, because of the success of this method and the damage possible to the targeted craft. The best time to "SAM" or "Surface to Air Missile" launch is when the lift drops out in the middle of a contest heat and the planes can just barely fly. Pick a target close to the hill that is approaching from downwind (for lower groundspeed), wait until it's just past you, and just throw your plane as hard as you can right up the bogie's six! With good aim, the massive energy transfer to the target will surely cause his flight path to divert significantly from straight and level, or at the very least something like an aileron or elevator linkage will break causing a slightly slower death, and maybe even taking a plane out of the contest for a few minutes for repairs! To get a hefty throw with a warbird and most other conventional planes, it is necessary to launch inverted for a good grip. Be sure and practice this ahead of time, as a surprisingly sudden arc straight into the hill will be the result if your thumb gets stupid in the heat of the moment. 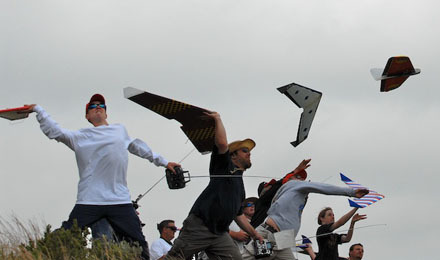 A flying wing must be launched with the fingers of the throwing hand hooked over the center of the trailing edge for best throw power, and never launch these inverted, DUH!